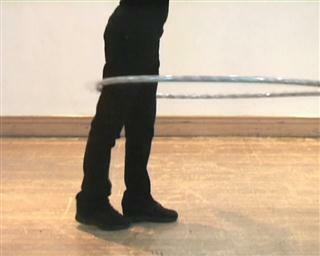 Bringing the hoop up from the knees to the waist is difficult. There may be moves which are more difficult but this is up there with the hardest. 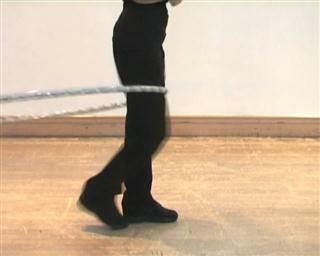 I know really good hoopers who still find this difficult and resort to bumping the hoop with the knee instead. I often hear grumbles about not having the right clothing on etc. I've talked before about how to move the hoop upward. You make bigger circles below the hoop than above it. You can do this from knee to hip but it really takes a lot of practice. Fortunately you can use a modification of the Elvis Leg to get round this. Using this method will enable you to learn to bring the hoop up. 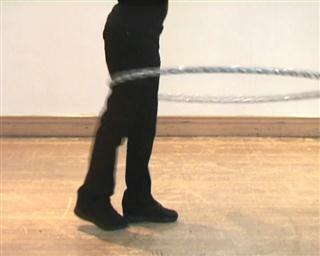 you will then be able to bring the hoop up by circling. 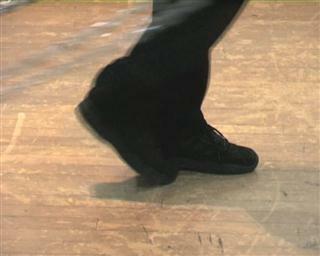 In the elvis leg, most of the energy goes in at the front. I need to balance this by creating lift at the back. I need to change the postion of my leg. I do this by drawing the toes of leg one back to the heel of leg two. I'm now able to put lift in at the front. And at the back by pushing the back of my leg upward. that generates lift at front and back. You can generate more lift, further up your thigh. make sure that your feet are close together. you should have lift, front and back. The forward backward motion you make must be clean. The motion must be in a straight line from front to back. Don't make circles and do not let your working leg cross your body. This will lock the hoop into position and it will go nowhere. the hoop is tilting because the energy is mainly at the front. the hoop starts to level out. slowly gains height with each lift. 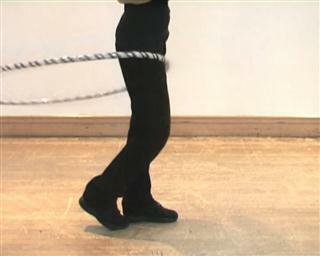 Once the hoop reaches the top of the legs you stop the Elvis leg motion and start making quick thrusts. As is often the case, turning makes it easier (although turning may itself be more difficult). If you practise this, keeping all the points in mind, you will succeed. The more you practise the more sensitivity and control you'll develop in your legs. 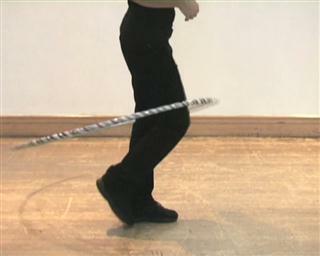 You can then try to bring the hoop up with knee circles. When practising that, turning really really helps.